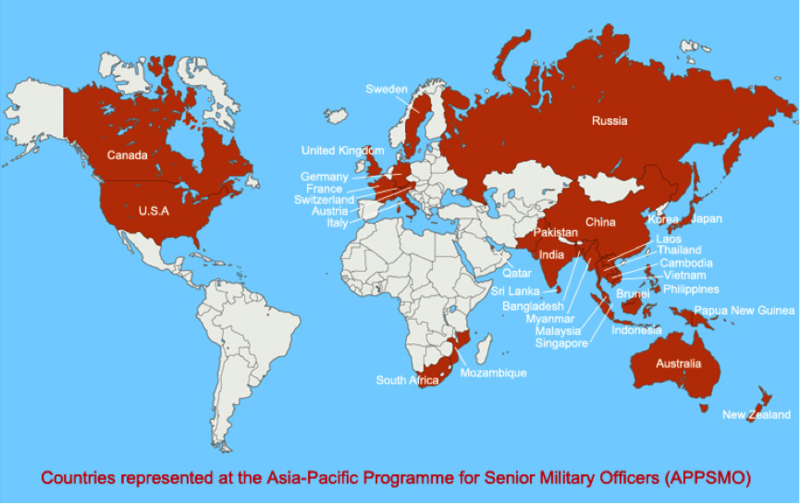 The Asia Pacific remains a region of security concern even as it becomes the pre-eminent growth area in the world. Civil and military authorities have a shared interest in the management of security concerns and for building durable peace in the region. It is imperative that they dedicate themselves to dialogue and consultation in order to build mutual confidence and avoid or resolve conflict amicably. At the inter-governmental level, the ASEAN Regional Forum (ARF) and ASEAN Defence Ministers Meeting Plus (ADMM-Plus) are experimental mechanisms for confidence building and conflict resolution. At a military-to-military level, the Asia Pacific Programme for Senior Military Officers (APPSMO) organised by the S. Rajaratnam School of International Studies (RSIS) and its component Institute of Defence and Strategic Studies (IDSS), provides an informal forum for military officers from the Asia Pacific and beyond to interact on a pan-regional scale. APPSMO enables senior military officers to meet and establish personal relationships as well as share knowledge about military and security developments that would be of professional interest to them. Through this process, the participants can contribute towards fostering a dynamic yet stable environment conducive to the maintenance of peace and stability in the region — an activity which has hitherto been the preserve of diplomats, officials and academics. In his keynote address for APPSMO 2014, Second Minister for Defence, Mr Chan Chun Sing said that: “The Shangri-La Dialogue, APPSMO and many such dialogues are useful platforms for countries and officers to meet, even if their respective countries are not on the best terms.” In this regard, APPSMO will continue to serve as an important instrument of defence diplomacy. The success of the previous gatherings since 1999 has encouraged RSIS to continually organise the event. APPSMO provides a venue and opportunity for promising senior military officers of the region to acquaint themselves with their counterparts. This objective fits the RSIS’ remit of fostering closer ties and working relationships among defence officials, military officers and strategic studies analysts in the region, and of nurturing a network of defence thinkers and planners. The objective will be achieved via two main activities. One is through lectures and informal discussions. These activities will give participants the opportunity to update their knowledge on the key trends and developments in defence and security-related issues. The interactive discussions will enable them to get a feel of the developments that are of professional significance. The programme for each day are rooted in a focused sub-theme that frames the panels and discussion points for each particular day. Each sub-theme and panel will address salient developments and trends across the spectrum of operations and key domains as well as their potential impact on the military profession. To that end, RSIS invites prominent speakers, scholars, and practitioners in the field of military-security affairs to speak on the topics related to the theme of each edition of APPSMO. The other is through social and recreational activities. These activities give the participants the opportunity to interact in an informal and relaxed atmosphere. Activities such as team sports and excursions are planned for the afternoons. The idea is to afford plenty of time and opportunity for the officers to interact during the recreational periods. It is hoped that after a week of such social and intellectual interaction the participating officers will develop lasting relationships professionally and personally that will help promote mutual understanding and goodwill among the military services of the Asia Pacific and Europe.